This is a picture of my back yard. Some of the wild Muscovies are in the front of the picture, and far behind out by the lake is some wild white Ibis. 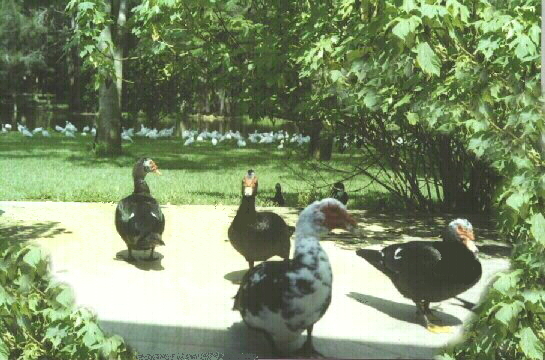 Do I mind all these fowl being in my yard? Do they hurt my grass? Look at the picture. Have you ever seen thicker greener grass than this? I have no sprinklers in the back yard either. 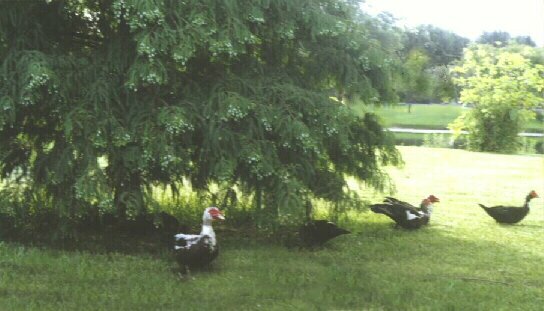 The Muscovies take good care of my yard, it is them, that make it so beautiful. and it is great for the grass and plants. but Ducks poo you just wipe your foot in the grass it wipes right off, it is not greasy, it is natual, and it does not stink. You can also hose it off very easy. Look at what the ducks did to my Cypress Tree. that it is weighted down with limbs. 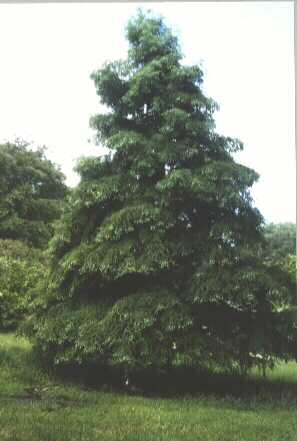 This tree is absolutely BEAUTIFUL!! You can see some ducks under it here. I named this tree my "Carmen Miranda" tree. notice it is LOADED with little white cones, so much that it looks like snow. 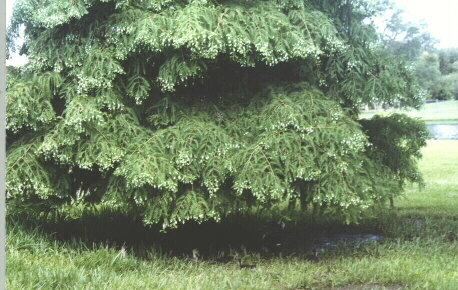 This is only from the ducks, otherwise it would be just a regular Cypress tree. Here is a picture that you can see more of the ducks with the tree, they lay under it, and love it. So don't let no one kid ya, their droppings make GREAT fertalizer. I was looking out my window at the Muscovies and the squirrels and birds all eating together in harmony on my patio, and this song (What a Wonderful World) was playing while I was watching them, and it was so nice and peaceful, and I was thinking, it could be a wonderful world, if only people could get along like these fowl and animals, and if people would just live, and let live. I have seen so much cruelty out of people tho, that, this song is just a wish right now, but, I hope that one day, there will be such peace, and that people will let fowl and animals alone, to have a life. The wonder of that wish tho, is that one day it will come true, when the Lord returns, He will bring peace to the world for a thousand years, and it WILL be a wonderful world!! So that is why I put this song on this page. because they will be up against people shooting back. and we THANK THEM for their service to our country! it usually only kills to eat. There are a few animals that do kill just to kill tho, but, not many. The Coopers Hawk and the Sharp Shinned Hawk are 2 that will kill just to kill. They are considered worthless pests! or to decorate your wall with animal heads, it should be against the LAW!! Killing for necessity to eat is one thing, but, not for sport, that is awful!! Wearing real fur is awful also. Another thing bad about hunting is that MANY, MANY animals or fowl get wounded and are left on their own to die a slow death, or to go on for years with a wound that has hurt him for life and he has to live with the pain and trouble the rest of his life. You do not hurt, injure, draw blood nor kill for sport or fun at all, it is awful! God did not bless us with His creations for us to abuse them. unless you are killing predators, then you have a reason to hunt.